The ROI for managing your payroll and accounting internally just isn’t there. You pay more money for less expertise, less time, more complexity, and more risk. Get back what you do best – running a competitive, profitable franchise – and outsource your payroll and accounting to Delaget. The result? Watch your profits increase by cutting overhead, eliminating late payments and errors, and adding efficiencies. 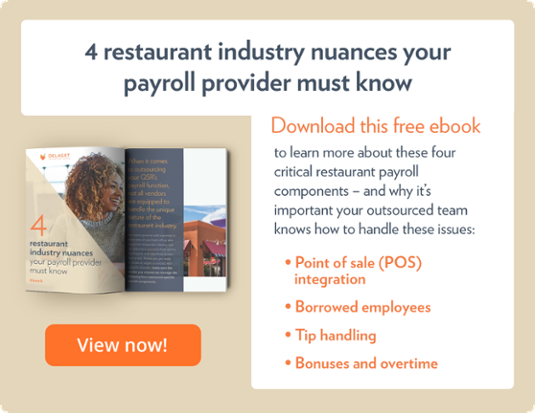 When you use our restaurant payroll services, you’ll have more time to focus on growth, operational enhancements and guest experience, and make quicker, better decisions. See for yourself what’s special about Delaget Books payroll and accounting services for restaurants with the resources below. Not all loss happens at the register. Reduce your risk of theft after cash leaves the drawer with our Cash Verification services. Actionable reports are delivered to your inbox each day, calling out inconsistencies, and keeping the right people in the know. We’ll also manage your bank’s “positive pay” service to reduce fraudulent activity on your account. Make better decisions, faster, and focus your attention where it’s needed with detailed Financial Reporting at the store, group, district, brand, and enterprise levels. One of our dedicated staff accountants will manage your bank reconciliations, audit schedules, fixed assets, financial statements, outside audit support, royalties and advertising, and sales and use tax. Get ready for some vendor appreciation when you pay every invoice accurately and on time with our automated Accounts Payable services and your dedicated AP team. You can access and approve documents at your desk or on the go, and pay vendors by check or electronically. Save time, avoid technology headaches, and stop worrying about changing laws and regulations when you choose our turnkey Payroll services for restaurants. Your dedicated payroll and tax team will take care of every aspect of payroll from garnishments to PTO to filing and paying your taxes. They’ll factor in borrowed employees, special overtime rules, cross-company calculations, and more. Getting rolling with Delaget Books is easy! We’ll walk you through our 5-step onboarding process, train your team, and be there to answer questions and offer suggestions on how to make the most of your Delaget Books services. Not only will you be saving time, you’ll see improvements in the accuracy and efficiency of your payroll and accounting.